MardiGrasTraditions.com captures the true spirit of Mardi Gras in an HTML5-compliant environment that’s free of distracting clutter and renders beautifully on tablets and mobile devices. MardiGrasTraditions.com offers prospective sponsors a fun, uncluttered and captivating environment showcasing the true spirit of Mardi Gras. We’re not a site that sells “advertising” to all comers, however, because we’re only interested in showcasing products, services and messages that are relevant to our audience and consistent with our mission. Nor is it our policy to exclusively promote businesses that pay money to Mardi Gras Traditions. The “pay-to-play” model — whereby sites only feature businesses that pay for placement or referrals/click-throughs — is old school. It’s also naïve in a way because on the Internet, no business exists in a vacuum and your competition is only a click away. The same principles apply to Mardi Gras Traditions, dictating why we’re not in the business of creating or duplicating certain content — live music listings and parade maps, for example — that is readily available elsewhere. If we don’t have it and somebody else does, we’ll send our visitors where they need to go to find it. Our modus operandi, in developing original content and helping people find relevant information, is not to exclude the competition but to generate more business for everyone. So if you’re a vendor with something that we think is of value to our audience, we’re not going to exclude you for competitive reasons. Even if you’re in the same line of business as one of our sponsors. 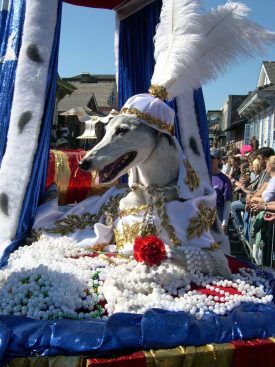 Thus, prospective sponsor-partners you may find their competition listed or discussed as part of Mardi Gras Traditions’ editorial content. Should that be a disincentive to becoming a sponsor? Maybe under the old-school way of thinking. In fact, sponsors can benefit from the traffic generated by useful content that includes mentions of competitors. That’s because in the uncluttered, HTML5-compliant environment of Mardi Gras Traditions, sponsors can receive enhanced visibility throughout the site and benefit from the goodwill we’ve created with our audience. We work to ensure that sponsorship not only increases brand awareness but also results in the conversion of visitor traffic into sales. The reason we’re not shy about asking our audience to support our partners is simple: sponsorship underwriting allows us to step-up our technology, content and overall creative execution. To contact us regarding sponsorship, click here.